Copyright of Forever After Blog. Do not use without permission. Powered by Blogger. 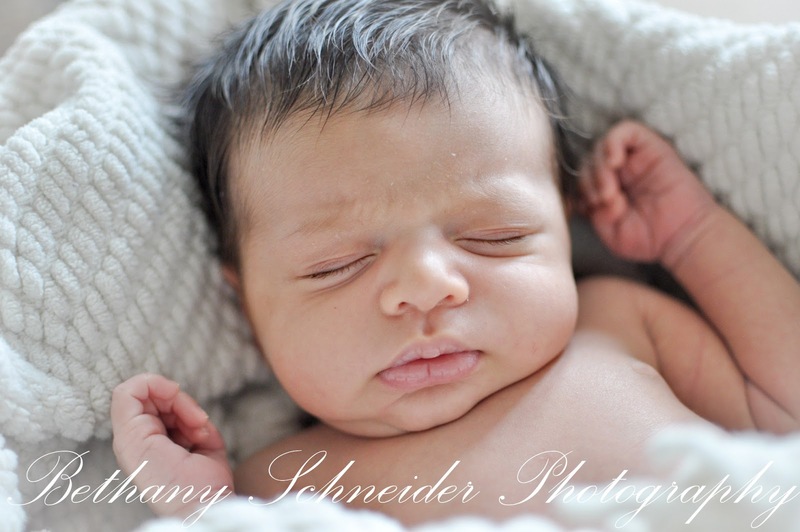 Last month I had the joy of being able to photograph precious Baby S, just 3 weeks old at the time. 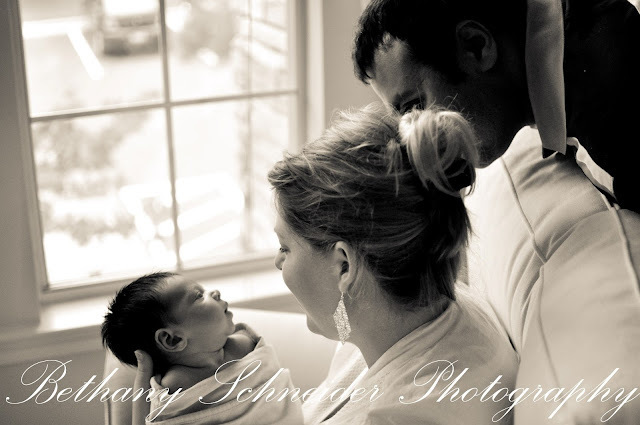 Newborn photos are always a sweet experience for photographers. But having just been there myself a matter of months ago, being able to capture this moment in their lives was an incredibly moving experience for me. Around here Daddy and Caroline like to do special things for Mommy. Things such as the occasional Daddy wakes up before the break of dawn when baby is ready to rise and entertains her so Mommy can sleep in, or combining creative forces to make a card. 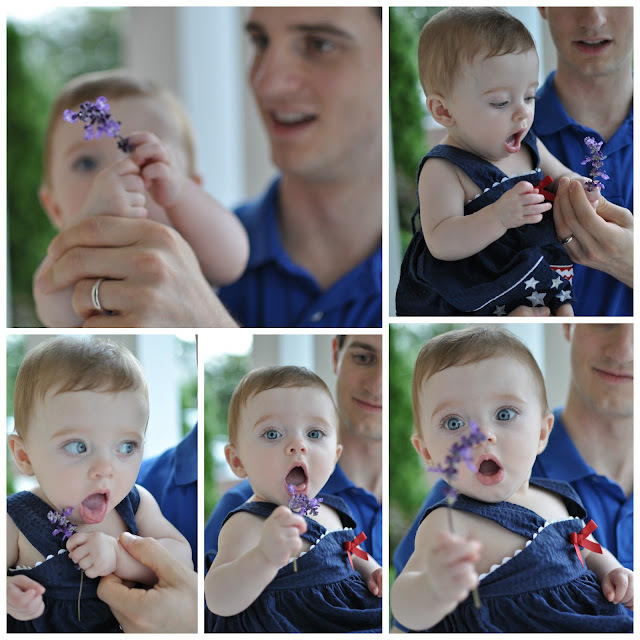 And some evenings, when we've just gone on a family walk and Mommy heads inside to wash bottles and put away dishes Daddy and Caroline linger to pick Mommy a flower. And sometimes try to eat it too. Not to worry. She didn't actually ingest any flower, just got quite close. Though I may have had to remove a lone petal from the tip of her tongue. We also enjoy attempting to eat paper napkins, junk mail, and Luna Bar wrappers around here. I say attempt because before I realized what she was doing one day after fetching the mail, she had actually bitten off and chewed a decent corner of a hospital bill. Caroline's way of making a statement to bite back at medical expenses? Well, at least she got a little extra fiber. 1) Spice....Mohawks: only cute on babies. 2) All sugar in a watermelon dress I found at my favorite kids' consignment shop...I could not resist. I had one like it when I was little. Plus watermelon is one of her favorite fruits. 3) Spice...I came upstairs to this one evening and I just about fell back down the stairs laughing. Don't worry...it's not dangerous like it looks...my husband is right behind the wall holding her. And her expression was just perfect for it. Spider Baby? 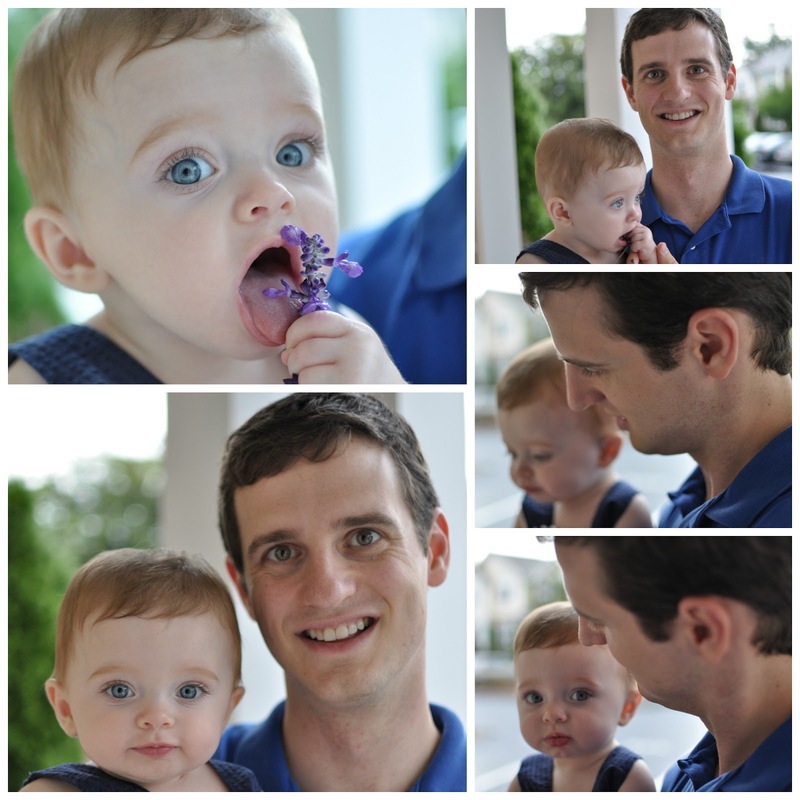 Caroline, you are 8 months old today! You've been growing and changing so much and this month you've started feeding yourself. It's been such fun to watch you chase little pieces of food around your high chair tray and triumphantly pop them in your little mouth. Which also brings me to some big news...your very first tooth! Your favorite foods are avocado and sweet potato puree mixed together, whole milk yogurt, banana, beans, super food greens puffs, and bread with hummus. You've become very good at sitting up and enjoy standing (with assistance of course) too. But you're not the least bit interested in crawling or staying on your tummy longer than it takes you to flip back onto your back. You still have to have your WubbaNub to go to sleep and you absolutely love it. Sometimes when I check in on you you're stroking your little kitty WubbaNub in your sleep. You usually take 2 naps (one morning, one afternoon). You're sleeping through the night (hallelujah!) going to bed sometime during the 8 o'clock hour time frame and waking up around 5 for a bottle, then back to sleep for just a bit more. Your favorite things to play with are the small stuffed giraffe, your Sophie giraffe (noticing a pattern anyone? ), and boxes, Daddy's sunglasses, and food wrappers. Sometimes I wonder why I even bother buying toys because 95% of the time you'd rather play with a non-toy than your toys. Though I miss the days when you were cuddly and content just to snuggle with me. I enjoy even more each new stage as your little personality comes out. Last Independence Day stands out so well in my mind. 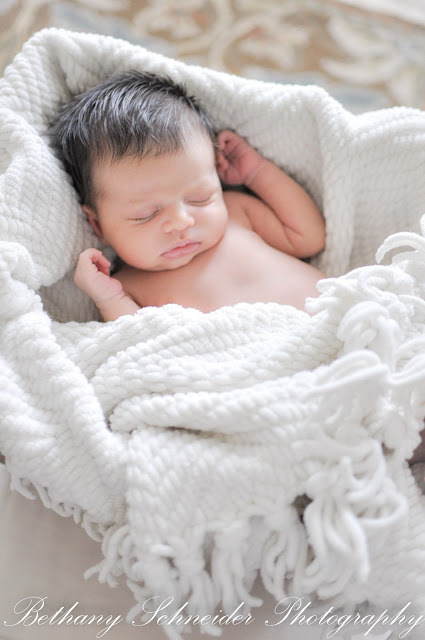 I remember I had felt like I had just started to come out of the cloud of really bad morning sickness I had suffered with the first few months of pregnancy. And in celebration of finally getting my appetite back (or should I say any taste at all for any food- you mamas who've had bad morning sickness understand me here!) this once vegan chica decided to dive into the North Carolina BBQ luncheon at my parent's swim club. Ummm bad idea. Though that pulled pork, chilly cold slaw, baked beans, and hush puppies (aw geez those things are tempting!) were good for the eatin' they were just too much for preggers gal. I spent the entire next 24 hours lying on the sofa feeling like the plague had caught me. And my husband had a deadline at work so he wasn't home till after midnight to take care of me (because I believe sickness always requires a sympathy vote). Y'all it was bad. I couldn't even drink water. As I crawled up the stairs to climb into bed (yes, literally crawled, and yes I was pitiful) I thought that the next 4th of July would be different. 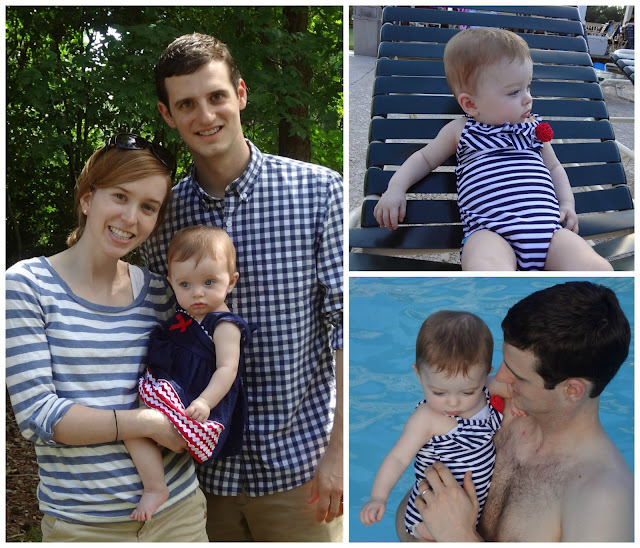 So needless to say I picked up an adorable patriotic dress at my favorite consignment shop when Caroline was just a couple months old in anticipation of redeeming the summer holiday. We stopped by my parent's house for a bit. And I was super excited Mike voluntarily put on a shirt to match our patriotic colors. He's generally not a matchy matchy guy. We also stopped by some friends' cookout and took Caroline to play at the YMCA playground. And just cause I can get discouraged reading other mommy blogs and seeing everyone in holiday matching outfits and upon clicking the links they post I realize they spent more than my entire season's clothing budget on just their child's outfit (whew...that was long winded...did ya follow me? 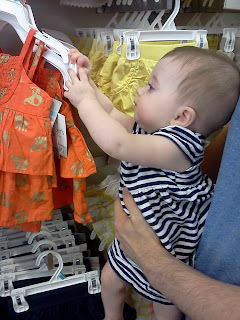 Cute blog = cute kid = cut outfit = second mortgage to afford it = discourging)...I thought I'd say (whether or not you think we're actually cute matching or not, just let me live the dream) I didn't spend a pretty penny on our 4th get-ups. My shirt is Ann Taylor Loft but I got it free at a clothing swap (thanks, Paige. You know my address if you ever want to clean out your closet! ), Mike's was bought with a giftcard, Caroline's patriotic dress was consignment and her striped swim suit was Target. All that to say things can be done on the cheap and I did not spend $50 on my daughter's dress. From feeling like the plague to having a fun baby girl to celebrate with. I'd say 4th of July weekend just moved up in my book. Now here's to hoping I can redeem Thanksgiving (Caroline was 4 days old and I hadn't slept more than 1 hour at a time since before her birth) , Christmas (I was in the worst pain ever...and I'm a natural childbirth mama so I'm talking pain y'all! thanks to an extraordinarily rare breastfeeding complication), New Years (I was in emergency surgery thanks to the aforementioned "extraordinarily rare breastfeeding complication"- "extraordinarily rare" is not a phrase you want to here a highly experienced surgeon say), and Valentine's Day (you guessed it...hospital again surgery again because we just love the in room TV and delivered food...kidding, I am soo kidding). I think I had 4 entirely different points just sprinkled (or one might be a little more honest and say splattered) throughout that post. But whew I got it all in. 1) Caroline's napping has been a battle today. It took me 2 hours to finally convince her taking a morning nap might be a good idea. Same goes for afternoon nap as well. We missed both baby lapsit at the library and an afternoon walk with our friends Ashley (mommy's friend) & Olive (Caroline's friend). You're a slave to the book in college, a slave to the clock once you've landed a job, and a slave to the naps once you become a mom. 2) I decided mid mega grocery haul at Target today (Caroline rode happily in the Ergo, best invention EVER) that we'd have avocado egg salad sandwiches for dinner tonight. I finally managed to have all the ingredients on hand for a non-oven necessary dinner (broken oven...still) without calling Mike on the way home from work with a grocery run request. Aaaaand I managed to hard boil the eggs for 3 hours. Yes, 3 hours. Life happened while the eggs were cooking. 3) I ate an unmentionable amount of 70% dark chocolate chips during both morning and afternoon naps. Some mamas have their evening glass or wine. I scarf down chocolate. As I tell my husband often "I'm going to the kitchen to eat my emotions", he just laughs every time. 4) I picked up some Happy Baby Spinach Puffs for Caroline during our major grocery haul and she absolutely loves them. And...ahem... I might have downed quite a few myself. Them things are gooooood. Confession: I spent naptime this week watching Season 2 of Downton Abbey (thank you public library!). I sort of skipped season 2. We had a lot going on combined with not having a TV (cause we're just weird like that), I never watched an episode. You can imagine I was a little lost throughout most of Season 3 (which I watched avidly, also during naptime). Anyways it's been a nice hiatus from my to-do list and what Anglophile doesn't love a good Downton marathon?